1. The open-loop gain shows no tendency to low frequency peaking since the modification of C9 to 2200uF. This being borne out by the smooth roll-off at low frequency of the closed loop curve. 2. There is an average of 57dB NFB 40Hz - 420Hz, which is wider than a conventional design, and so sounds in this range will not suffer the typical "all-leading-edge distortion". 3. 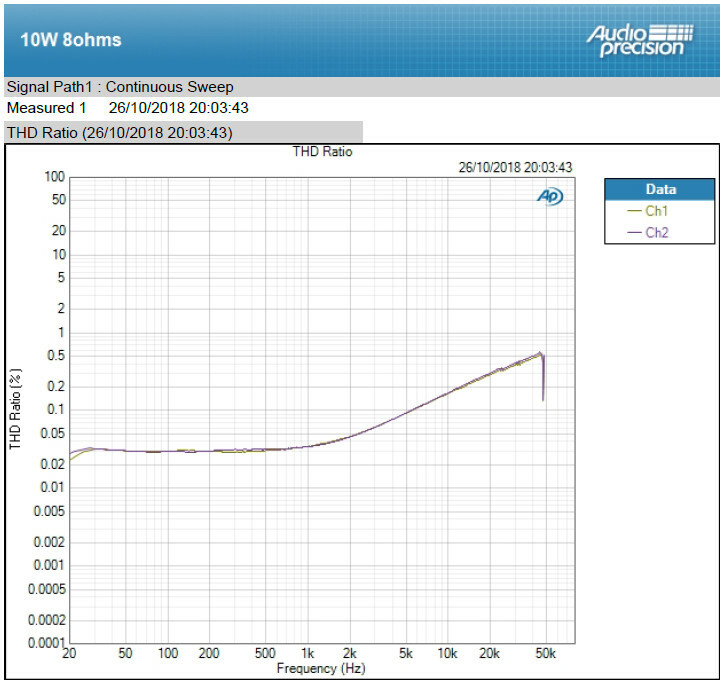 The 50dB of NFB at 1kHz has helped to give us the 0.02% THD+N. 4. With NFB reducing to 31dB at 10kHz there is nearly 1/10th of what there is at 1kHz, which would indicate 0.2% THD+N, but we are getting better than that. 5. NFB falls off at 6dB/octave so that at 20kHz we can expect double the 10kHz distortion, and measurements show it is less than 0.4% THD+N. 6. The open loop curve does not continue flat to the left because this design is AC coupled. 7. 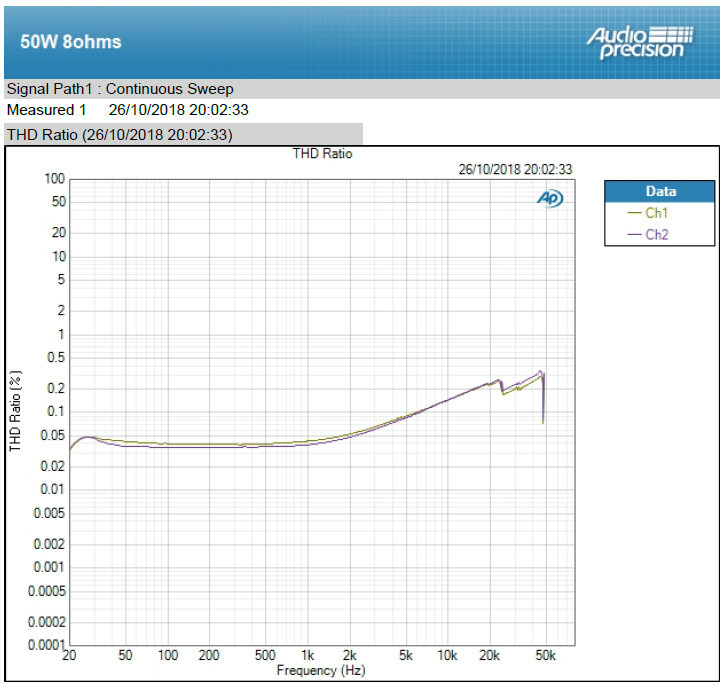 The roll-off rate of 20dB/decade at frequencies above 1kHz demonstrate the stability of the design. 8. 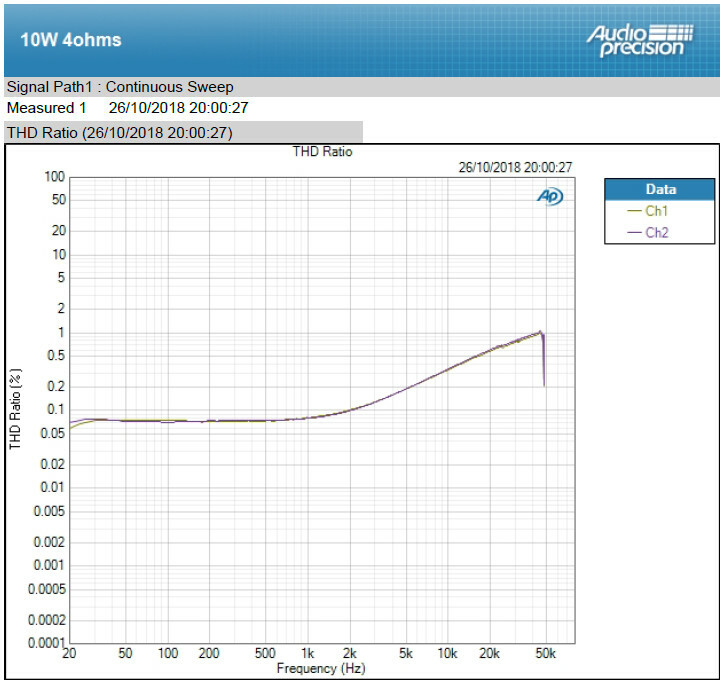 The output crosses 0dB (where gain transitions to attenuation) at 9.3MHz. This is its gain-bandwidth product. By the slew-rate formula presented in The Art of Electronics it is 26V/uS. By the IPS current over dominant pole capacitor formula it is 42V/uS. Both quite acceptable. 9. The phase margin is 83.7° which is very close to the 90° ideal. It ensures there is little if any overshoot. 10. The gain margin is -30dB at -180° which means there is very little chance of oscillation as the signal would have to rise 30dB for that to happen. -20dB (1/10th) should be considered the upper limit IMO. 11. It has to be noted that the last three comments are based on the MPSA06 SPICE models and their accuracy, but as they indicated C5 was no longer required to obtain the gain margin, and in practice its removal assisted in lowering distortion a little, I think the models might be correct. 12. You will note a slight glitch in the phase curves at 2.3MHz. This is due to the reaction between the 10n (C8) bypass of C9 and the lowering of its series resistor to 1 ohm. The distortion gains outweigh this slight glitch. 13. No out of band artefacts can be seen, at least to nearly -60dB. 14. 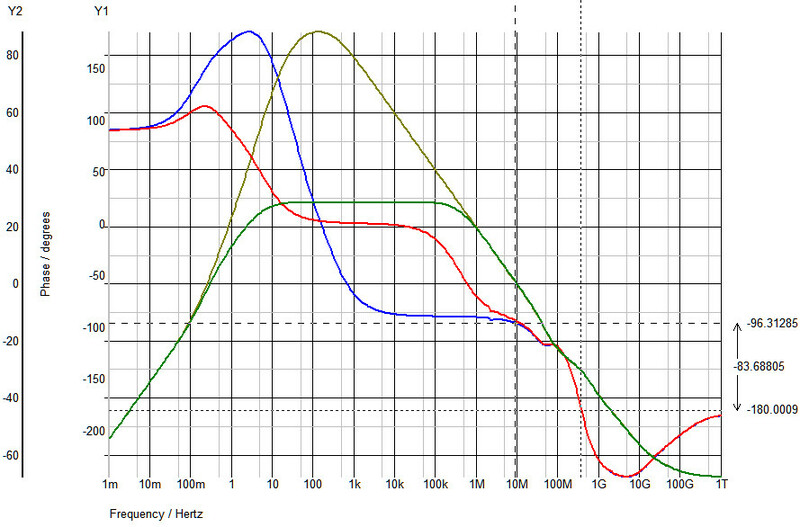 Phase is maximally flat between 100Hz and 10kHz and so tempo should appear perfect. 15. Why the MPSA06 should demonstrate such "perfect" behaviour as opposed to the highly favoured 2N5551 (and other transistors tried) is not explained anywhere on the internet, or in any books I have read. I can only assume that it was introduced by Motorola whilst they were making linear amplifiers and they must have decided to make it as blameless as possible to obtain the "best" sound for themselves. We can therefore benefit from it today. It's becoming accepted to show a distortion sweep rather than just showing THD+N at spot frequencies, and review magazines such as Stereophile often feature a specifications page where they show the measurements they've made. However, these are shown as THD+N, where my APx525 only has THD on continuous sweep, but AP say (quote) "The difference is negligible for all reasonable distortion levels". Make of the following what you will. I am not sure what the mechanism is which caused the jump in THD at 31.5kHz in the 50W/8 sweep, but as most review measurements just go as far as 20kHz I'm not too concerned. Those who might recall me writing about the fuses opening at 20kHz and 75W might wonder how I managed to get a sweep right up to 50kHz? Well, that's the other news: I felt that maybe things weren't quite perfectly stable, even though everything else measured OK, and the simulator was showing excellent stability. But changing the dominant pole capacitor from 47pF to 100pF allowed the above to happen leaving the fuses intact, so maybe there was a little instability? It means that slew rate is reduced to 20V/uS, but I think that's quite fast enough and means the rise (and fall) time to 50W into 8 ohms will be less than 1.5uS. The inverse of which gives 700kHz. Next up: some square waves. These measurements were taken with the input filter in situ and so will not demonstrate the declared (20V/uS) slew rate (but having said that and taking a second look it's not far off). They come in handy however to see if there is any instability. You can see a tiny bit of ripple on the negative square wave of the 20kHz sq wave 4 ohms 64 watt reading, and this is where I think the simulator was getting a little confused: the complimentary feedback darlington formed by T5 and T7 works much faster than the emitter follower of the upper pair, and op-amps with similar outputs (NE5532; NE5534; LF356 etc) tend to simulate OK just the same, but in practice could be slightly unstable. This is a similar output stage, and I think reducing slew rate was in order, and quite a sensible move. Just thought a quick update was in order. After reading my post on transistors and many of them being end of line, I thought you'd like to know this project will be kept alive as I've bought sufficient MPSA06 transistors to keep it going for years. Not a bad price and they're genuine On-Semi. I also decided to chance my arm (not literally) on quite a few MPSA56 transistors by Central Semiconductor. Another note regarding distortion: I don't know how I do it (probably it's because I'm truthful) but this amplifier design needs (yes, you guessed right) a warm up time. I did a recent distortion sweep immediately after switch-on and almost cried. But after a few minutes of actual use the distortion was back to where it should be. I'm also in communication with case and transformer manufacturers, hoping to get both as prototypes in the coming weeks. Although this started as a kind of design excercise you can take it that I'm serious about launching it as a product one way or another. Whether it is technically correct in this day and age, or not, it sounds good enough for me to like. And that should also mean the 5V 3A power supply gets its case at long last. How much warm up time is needed to give less than 0.2% THD ? And , how long does it take to get close to your measured best THD ? Hi Bruce, I drove it at 1W for the time it took to answer an email. Not sure how long but when I ran the distortion sweep again it was back to where it was on the print-outs I posted earlier. Those are all below 0.2% up to 5kHz or more depending on load and output level. I found when adjusting the output voltage and output stage current trimmers that the "sweet-spot" takes some fine adjustment. This has got me thinking that I should use multi-turn trimmers. It is the output voltage trim which has greatest effect. Currently I'm within 0.1V difference between the channels when adjusting whilst reading the distortion meter. I'm sure there will be a definitive voltage which should always give the best reading. But then I'm aware how much the mains voltage fluctuates during a test. Even with the big variac set on exactly 230V (115 stateside) it can be 228V or 232V next time I check. This is nearly 1% variation in supply volts and sufficient to throw distortion from the best reading to twice that. Still below 0.2% though. It got me thinking about those hyper critical Stereophile review measurements you see on the web. Where one channel can be significantly different to the other. This is bound to be because of mains fluctuation. I'm sure the manufacturer's test technician will have trimmed it out properly, but it can only apply to the voltage available at that time. A stabilised supply takes that problem away, but such a supply depends on its pass transistor and circuitry being as good as the amplifier output stage. For the same output swing you need a bigger raw voltage, and that becomes more expensive in numerous ways. For one think about the heat. The Proprius can carry it off because the stabilised supply is switched-mode, and individual to each amplifier. But the end user generally wants the least fuss which means one box containing all. I'll also hazard a guess that any amplifier when in its intended use that the distortion will never be close to a lab measurement, and might be nearer 1% no matter how good the test gear shows it. So how does this design sound? Well here again I've found it changes, and I want to pin down why and when. I leave it on most of the time - days at a time - but it gets switched off and back on during testing and after trying this and trying that. I have tried a few grounding modifications to see if I can improve it, but I kept arriving at the same conclusion that I had it right at the point when I said the speaker grounds should be from the large decoupling capacitor ground connection. All I have done in reality is make all the grounds use the same 32/0.2 wire. Same with the HT. All other wires are 16/0.2 including the speaker lives. The only other thing was I took out the transformer bolt and dished washer because I was aware of case noise (transformer vibration heard through the case). This took case noise down slightly. The sound took me by surprise. It had changed and the sound stage, tonal purity, tempo, all that sort of thing had become more together and had become more smooth, using that word in the way we're used to on here, and not meaning lacking detail, because there's detail a-plenty. Dare I say holographic? Too difficult to replace the transformer bolt whilst listening, I simply sat the dished washer back on the top of the transformer, then off again. At first I thought it made a difference, but then I couldn't detect it. Therefore it could have been the bolt. Both dished washer and bolt being ferrous. I'm talking to the transformer manufacturer about centre filling the transformer with encapsulation material and drilling it out to take the mounting bolt. I think the bolt needs to be stainless steel. The effect on measurements? None! The problem with stereo isn't so much crosstalk due to proximity or shared power supply, but by the way it is grounded. Power amplifiers don't act like preamps and if you distribute zero volts from an input location star ground it will result in hum (or it does every time I try it). The power supply ground must go straight to the power amp ground, and as this ground inevitably has impedance, current demands will see it ebb and flow. The input ground to the amplifier must be one and the same or the ebb and flow will be injected, so all upstream grounds must connect. In mono, yes. In stereo no. At some point left and right grounds join back together. They're bound to unless the signal is kept dual mono at every stage. Design an amp for that and there will be few takers. So they might as well join at the input sockets and all commercial twin phono sockets have their grounds strapped together. Now, I'm not talking about earths, although ground and earth get used interchangeably. Forget earth. Earth is the safety connection of amplifier chassis to mains earth, known as the mains protective conductor. But the metal chassis to be effective for shielding (screening) needs to be connected to ground at some point, and where the grounds join at the input is where this should take place. But we really need to forget about connecting anything to the chassis to understand the problem, so forget it. OK, so now I can explain. The power supply has its ground connection to which the left and right amplifiers connect, so here the grounds are joined together. Then at the inputs, the grounds are joined together. If both channels are playing a moderate mono signal, and then one gets a loud signal, the ground from its power supply drops signal voltage. Its impedance is pretty low but it can allow it to rise by several millivolts. The joined input ground injects this to the other amplifier's input, obviously upsetting the stereo image as well as causing distortion. You can split the grounds so one goes from power supply to the amp's power stage, and another goes to it's voltage stage, but this increases distortion in each amp, so you don't go there. Another quite old solution was to decouple grounds between power and voltage stages using a 10 ohm resistor. It being inside the negative feedback then distortion is controlled. Except, it too increases distortion. Except that just kicks the can down the road to the source (where they join properly). 1. single ground is where one heavy pcb track runs full length between mirrored layouts on the same PCB with all ground connections to it. 2. but layout might make that impossible, especially where each amp is heatsinked either end of the case. So the other answer is two power supplies. Rather than two transformers it can be two secondaries, but either way that means two bridge rectifiers, and two sets of reservoir/smoothing capacitors. So obvious when properly explained. What led me to this? Prototype testing both by listening and measurement. When trimming distortion using the voltage and current presets I could see the other channel reacting. Current was being pulled from somewhere. When listening I was aware that things in the stereo image were different than when using my Proprius which are mono blocks. But, you see, working as I had for others, many designs use single power supplies with separate amplifier channel layouts, and therefore possess the same stereo ground loop as I've been explaining here. Taking a look online at lids-off images there are quite a few commercial amps doing exactly the same. So what am I doing about my design? I thought about laying out both channels on one PCB as in 1. above, but being impatient decided to order a dual secondary transformer and another bridge rectifier. Even if I don't hear a difference each amp should trim without affecting the other.